Celebrate this 4th of July with your friends and family with a lunch cruise out on the San Francisco bay! 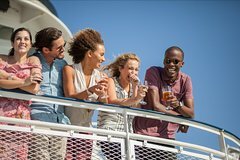 Enjoy a two-hour yacht cruise, a traditional BBQ-inspired lunch buffet with free flowing beer and champagne! You'll drift pass San Francisco's famous sights while enjoying live background entertainment. You can also opt you step out onto the sundeck to enjoy California's gorgeous summer!